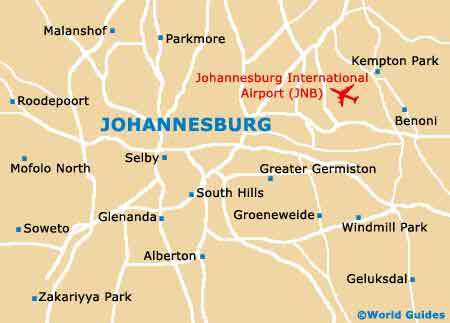 It's safe to say that Johannesburg is something of a shoppers' paradise. As well as a number of large shopping centres and retail outlets, there are also some great flea and craft markets. All in all, if you're looking for a special gift, then Johannesburg certainly won't disappoint. Be prepared to travel around though. Larger shopping centres tend have the longest hours, usually opening at 09:00 and closing at 18:00 in the week and at 17:00 during the weekend. Smaller shopping centres in Johannesburg may close on Sunday afternoons. The hours of Independent stores vary, with many of them closing at noon. Outdoor craft and flea markets start at around 10:00 and close at 17:00, although some may stay open until dusk. Johannesburg and its suburbs are home to dozens of shopping centres. They vary from those that offer a selection of stores and boutiques to their bigger and brasher counterparts, which boast cinema complexes and even miniature golf courses. 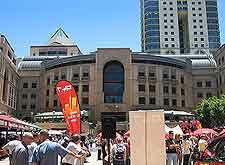 Sandton City is said to be South Africa's premier shopping centre. It's the place to pick up the latest hot trends and sample locally made goods. Above all, it is the place to be seen. The Brightwater Commons, formerly known as the Johannesburg Randburg Waterfront, is an urban shopping and entertainment centre with a difference. In the form of a small town high street, there are paved walkways, a village green, rolling lawns and a lake, which means that, between shopping, it's possible to take a break amidst pleasant surroundings. 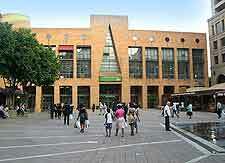 Oriental Plaza is a shopping centre with a difference. The Plaza has something of an old-style eastern bazaar feel. It's the perfect antidote to hours spent browsing chain stores and high street fashion. If you're looking for a bargain, then Johannesburg's flea and craft markets are just the place to shop. You'll find everything from painted wooden figures and masks to traditional jewellery and toys. The African Craft Market in the Rosebank Mall shopping complex is open throughout the week and weekend and offers goods that originate from all over Africa. 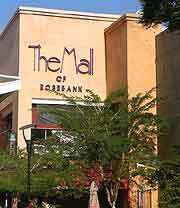 Also in Rosebank, on Bath Avenue, the Johannesburg Rooftop Market is reputed to be one of South Africa's top flea markets. An astonishing 500 stalls gather on Sundays to sell clothing, craftwork, bric-a-brac and ceramics. Not to be outdone, Bruma Market World is another vast flea market, usually with around 600 stalls.